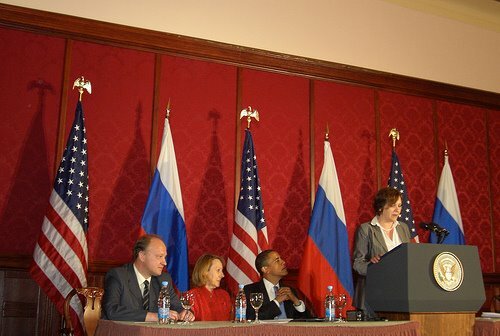 Esther Dyson’s Flickr account shows a July 7 photo of her sitting next to President Obama at the speaker’s table for a meeting in Russia. Her next appearance — a rare one, in her hometown — is Thursday, July 9, at the Princeton Chamber lunch, 11:30 a.m., at the Forrestal Marriott. Esther Dyson is a journalist and commentator on emerging digital technology, a founding member of the digerati, an entrepreneur, and a philanthropist. She has been highly influential for the past 20 years on the basis of her insights into online/information technology markets and their social impact worldwide, including the emerging markets of Central and Eastern Europe and Asia. In 1994 she wrote a seminal essay on intellectual property for Wired magazine and three years alter wrote Release 2.0: A Design for Living in the Digital Age. Born in Switzerland in 1951, she grew up in Princeton, where her father, physicist Freeman Dyson, is at the Institute for Advanced Study. She majored in economics at Harvard, worked as a reporter at Forbes, then did investment research and bought a company, renaming it EDventure Holdings. In 2004 she sold it to CNET Networks, the US-based interactive media companym and now operates as an independent investor and writer under the reclaimed name. An active investor as well as an analyst/observer, she participated in the sale of Flickr to Yahoo! and of Medstory to Microsoft, and her other investments included Del.icio.us, BrightMail, and Orbitz. Her primary activity is investing in startups and guiding many of them as a board member, including 23andMe (US), Airship Ventures (US), Evernote (US), Boxbe (US), Eventful.com (US), Meetup Inc. (US), NewspaperDirect (Canada), CVO Group (Hungary), Voxiva (US) and Yandex (Russia). She is also active in public affairs and was founding chairman of ICANN, the domain name policy agency, from 1998 to 2000. She currently sits on the board of the Sunlight Foundation, which advocates transparency in government.. She is one of 10 initial volunteers in Harvard’s personal genome project. She has serves as a trustee of, and helped fund, such emerging organizations as Glasses for Humanity, Bridges.org, the National Endowment for Democracy, and the Eurasia Foundation (which co-hosted the 7-7-09 Civil Society Summit in Moscow). . She is also a board member of the Long Now Foundation, a trustee of the Santa Fe Institute, and hosts the Flight School in Aspen. She is a close follower of the post-Soviet transition of Eastern Europe and is amember of the Bulgarian President’s IT Advisory Council. Last year she trained as the backup astronaut for Charles Simonyi’s Space Adventures trip aboard the Soyuz. In January she received the Aenna Burda award, for women in the media who successfully implement their extraordinary visions. Here is the link to Michele Alperin’s article in U.S. 1 on July 8. Those at the luncheon will have a chance to get Dyson’s take on their particular interests. She will speak briefly on “How can you weave together Silicon Valley, genomes, Russia, and space into a single talk” and then take questions.